Since System Center 2012 was RTM’d few days ago, I have started updating / migrating my home environment. After I migrated my 2 Hyper-V servers from VMM 2008 R2 to VMM 2012, I have started building a brand new SCCM 2012 environment so I can migrate SCCM 2007 to it. My plan is to install a Central Admin site, a child primary site and a Secondary site so I have a simple 3-tier hierarchy like my existing 2007 and 2012 Beta 2 environments. The Central Admin site and the child primary site installation all went pretty smoothly. But I had some issues when installing the secondary site. Use an existing SQL Server instance. I wanted to install SQL Express myself so I can control where it’s installed to and locations for data, log and backup files. – This is pretty common and most of SQL DBAs would configure to install SQL on a volume other than C:\ and place data / logs / backups on dedicated and separate disks. By using SCCM to install SQL express for you, you don’t get to choose any of this, which can be pretty annoying. 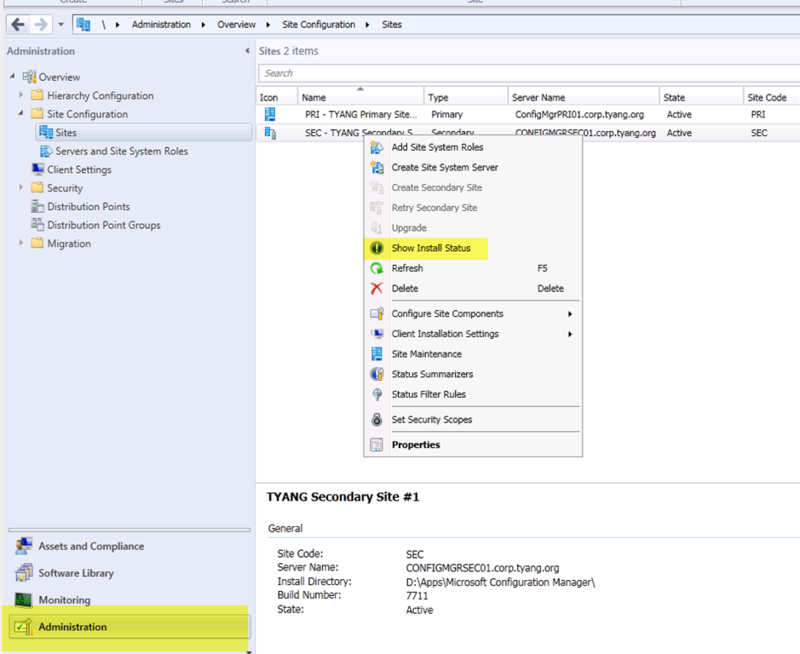 According to Supported Configurations for Configuration Manager, secondary sites supports SQL Server Express 2008 R2 with SP1 and Cumulative Update 4. So I downloaded SQL Server 2008 R2 Express With SP1 with Tools (SQLEXPRWT_x64_ENU.exe) and SQL 2008 R2 Service Pack 1 Cumulative Update 4 and installed them in order on my secondary site site server. I configured the location for SQL, SQL instance, data files, log files and backup files the way I wanted it. I selected the SQL instance to use the collation “SQL_Latin1_General_CP1_CI_AS” because it is the only collation that SCCM supports. I kept the default secondary site SQL instance name “CONFIGMGRSEC” (this name is what’s used if you choose SCCM to install SQL Express for you). I have given a pre-configured AD group called “ConfigMgr2012 Servers” which contains all SCCM 2012 site servers sysadmin rights in SQL Express. After the install, I applied CU4 and all went pretty smoothly. This is very strange because all my SQL instances in this hierarchy are set to this collation, and because of this, the setup did not even get kicked off. CSql Error: Cannot find type data, cannot get a connection. *** [Microsoft][ODBC SQL Server Driver][DBNETLIB]SQL Server does not exist or access denied. 1. 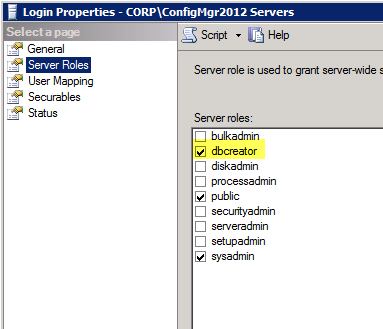 I’ve assign “ConfigMgr2012 Servers” group (which I created myself and it contains the primary site server’s computer account) “dbcreator” role on top of sysadmin role it already had. After you enabled TCP/IP and changed the port, you will be prompted that you have to restart SQL server service for the change to take effect, so I restarted the SQL service. After these steps, the prerequisite checks were passed and the Secondary site installation finished successfully. Configure SQL Express instance name as “CONFIGMGRSEC” as it is default to SCCM secondary site and there’s no reason to change it. Select “SQL_Latin1_General_CP1_CI_AS” as SQL server collation. Set a limit for amount of memory SQL express can use. 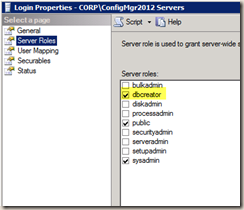 give the parent primary site server’s computer account dbcreator access in SQL Express instance. Enable TCP/IP for the SQL express instance. 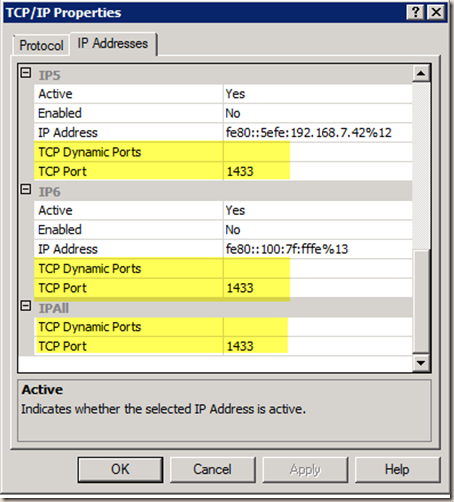 Configure TCP/IP connection port settings. 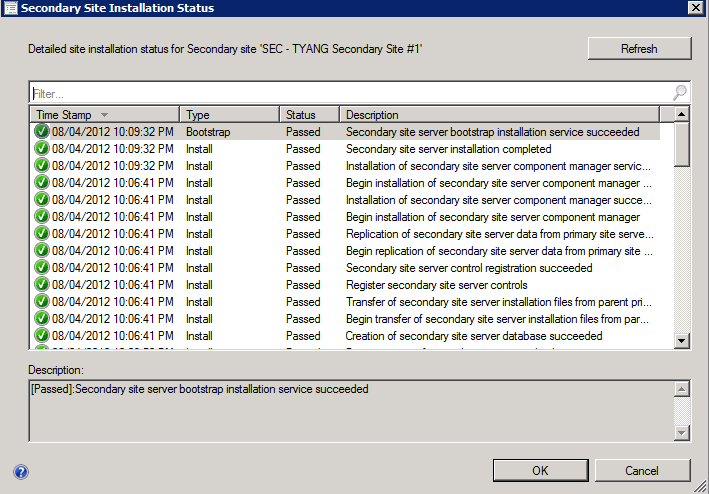 Initiate Secondary Site install from Primary site (via SCCM console). 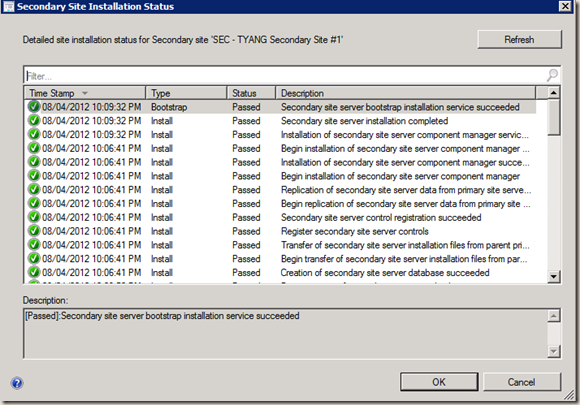 – Unlike SCCM 2007, secondary site install can no longer be performed by running SCCM setup from secondary site servers. 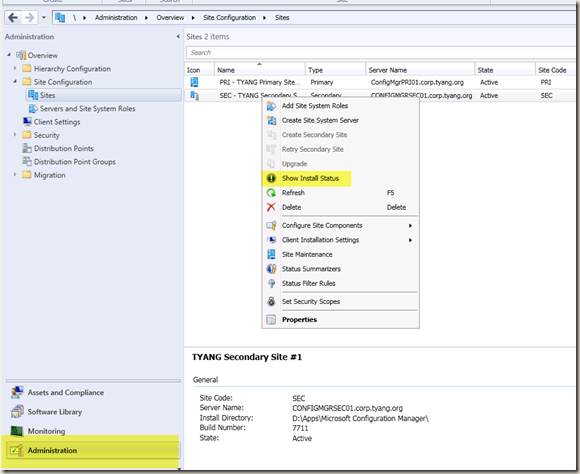 During setup wizard, choose “Use an existing SQL Server instance”, enter secondary site server’s FQDN and SQL instance name (“CONFIGMGRSEC”). leave site database name and SQL broker port as default. C:\ConfigMgrSetup.log on Primary Site server (contains details for Secondary Site install’s prerequisite checks). C:\ConfigMgrSetup.log on Secondary Site server (contains details for the actual setup). Now, instead of having SQL Express installed and configured by SCCM, I have more control of it so I can align the configuration with my organisation’s standard (if it’s in a real production environment ). Thanks for the update. that’s interesting. I’ve been using the default SQL port, which is 1433. I don’t think SQL browser service is required. Excellent thanks for this, saved me a lot of time! BTW I did have to enable the SQL browser service as well for the installation to complete as well. I think you guys are correct. SQL browser service is required. I must have over looked it. It is required because we are using a non-default instance of SQL (Not using MSSQLSERVER instance). Thanks all for the update. -CSql Error: Cannot find type data, cannot get a connection. 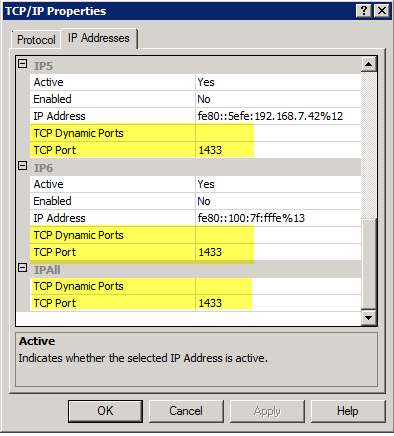 But even after enabling TCP/IP and setting the port to 1433 I still could not connect. I then validated that SQL Browser was running, but didn’t help. I used netstat -a to validate that TCP 1433 was listening and UDP 1434 shows as *:*. I could connect to SQL locally using SQL Server Management Studio and SQLCMD, but I could not remotely ***UNTIL*** I added the port to the connection string (CM12-Secondary\CONFIGMGRSEC,1433). It turns out that I didn’t set an exclusion in my SCCM Servers Firewall GPO for SQL Browser (UDP 1434). After adding the exclusion and running GPUpdate all is well. my sccm parent site server down and has HW failure. I want step by step guide to build new sccm site and ididn’t know from where to start.